For this review our regular Menacing Thick Fluffy Blanket, or MTFB, has become the MTFC - Menacing Thick Flannel Cloth. Rather than using multiple layers of an exceptionally thick and fluffy blanket, the kind ideal for those romantic winter nights up in a picturesque mountain cabin... we've settled on multiple layers of white flannel. 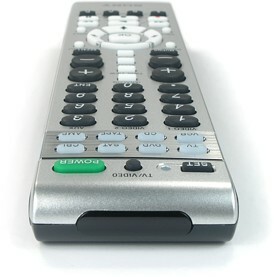 Since standard consumer remotes use infrared light to communicate with equipment, it's a simple matter to see exactly how powerful a remote's built-in emitters are by obstructing them with some sort of translucent material. In previous experiments this methodology has exactly duplicated the results obtained from actual real-world distance tests. For this variation of the test I've decided to use something that's roughly as thick and opaque to light as that old blanket, but can also be separated into much finer graduations. This new test continues to use the "muting" command for a Sony receiver head-on from a distance of 6 feet. I began evaluating the RM-VL600 with some trepidation, due to uncertainties as to exactly how well this new fabric would work. Level one, which is significantly thinner than our old test, proved inconsequential to the remote - or any other light source for that matter. Levels two, three and four were also little challenge, though as each layer was added a few degrees were knocked from the overall off-angle performance. Levels five and six continued to prove reliable, although off-angle operation was almost completely eliminated. Layers continued to be added until the pinnacle of the RM-VL600's dual IR emitters was at last achieved. The final number - eight. At level nine no commands were received at the test distance, although positioning the remote approximately one foot closer to the receiver did restore functionality. Of course this particular result has no meaning without some sort of comparison, and so I also tested several other remotes. The Sony RM-VL710 scored 8 (MTFB: 3.0), the RM-VL700 scored 5 (MTFB: 2.0), the RM-VL900 scored 5 (MTFB: 2.0), the four-emittered RM-AV3100 scored 8 (MTFB: 3.75), while the Home Theater Master MX-500 scored 11 (MTFB: 4.5). 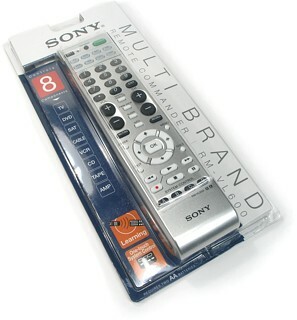 Sony's proud tradition of economical universal remotes that are actually usable continues with the very capable RM-VL600 at a price of only $29.95. And while I've always been a fan of products that do more while costing less, I can't say that that the RM-VL600 is a completely successful upgrade over the RM-VL710, although truthfully that opinion is almost entirely due to the unusually high expectations imparted by that remote. More devices, more macros, a larger code database and a better key layout are all great improvements, but attempting to deliver this at such a low price point has both impacted overall quality and continued to prevent certain much-needed features from being added, such as button backlighting. But with that said, in a market where price really is the most important factor this remote simply will not disappoint when held up against the currently-available competition. The Sony RM-VL600 has managed to position itself at the top of the budget remote category by offering unprecedented power for the money - a perfect blend of capabilities for a bedroom system or more modest home theaters. Also check out our review of the RM-VL600's sequel, the RM-VL610.